Is this the right air filter for you? 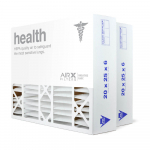 If you want the ultimate solution to bad indoor air quality, this is the filter for you! You won't find this filter in your local "big box store" and you'll probably pay a premium if you purchase it through your contractor. Purchase online with a few clicks, and we'll deliver quickly to your front door. NOTE: - you will need your existing plastic inner housing to use this filter; simply place the filter in the plastic inner housing and slide it in! What does this air filter remove? What part numbers does this filter replace? What air cleaners does this filter fit? Do you want to know about the technical specs? Nominal Dimensions 20 x 25 x 6"
Actual Dimensions 19-3/4" x 24-1/4" x 6"
Max Humidity Resistant to 100% R.H.